(Bloomberg) -- Democratic Representative Ben Ray Lujan of New Mexico announced that he’ll run for the U.S. Senate in 2020, bypassing the chance to move up in his party’s House leadership. 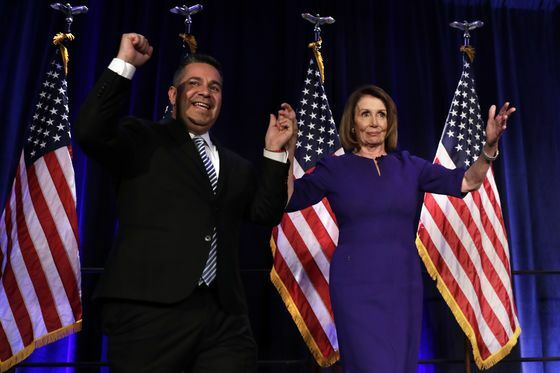 Lujan currently serves as assistant House speaker under Nancy Pelosi and has been seen as among the candidates who would be in line to eventually succeed her as speaker. The assistant speaker title was created as part of a deal in which Pelosi agreed to serve no more than four years to make way for younger members. Representatives Hakeem Jeffries of New York and Cheri Bustos of Illinois were also elevated into leadership positions. He was head of the House Democrats’ campaign arm during the 2018 election, in which the party retook control of the chamber. In his announcement video Monday on Twitter, Lujan, 46, emphasized changes he’s brought to the House and said he is running to do the same in the Senate. “To move forward, we’ve got to fix the Senate, where Mitch McConnell stands in the way of progress,” he said, referring to the Republican majority leader. Lujan was first elected to the House in 2008, succeeding then-Representative Tom Udall in New Mexico’s third congressional district. Udall gave up the House seat to run for the Senate, and he has said he won’t run for a third Senate term next year. Although Republicans are expected to make a play for the seat, it’s likely to stay in Democratic control, according to ratings by the independent Cook Political Report.